Also known as a red salmon or a blueback salmon, the sockeye salmon is a species that is found in the northern Pacific Ocean and the bodies of water such as rivers nearby that discharge into it. There are also similar species found in landlocked area called the kokanee. It is the 3rd most common species of Pacific salmon, after the chum and pink salmon species. You may be wondering how on earth the sockeye salmon got its name. Some believe that it is the anglicized version of the name used in Halkomelem, which is the indigenous language of the people living in the lower areas of the Fraser River. They are found in a huge range – from Columbia River to Hokkaido Island in Japan, and from Bathurst Inlet in the Canadian Arctic and to Anadyr River in Siberia. However, kokanee is the Okangan word for this fish species. 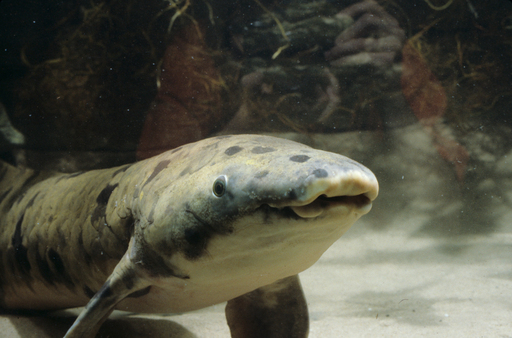 These species are small compared to its ocean-living cousins as they are rarely over 14 inches (350mm) long. In Okangan Lake, there are 2 kinds of kokanees as one spawns in the lake near the shoreline, while the other spawns in streams. Kokanees are all around North America, such as Yukon, British Columbia, Alaska, California, New York, New Mexico, Wyoming, Utah, Montana, Colorado, Washington, and Idaho. The sockeye salmon is blue tinged with silver when they are living in the ocean. Before spawning, both male and female sockeyes turn red with green heads and have dark stripe on their sides. Male sockeye salmons develop a hump back and their jaws and teeth become hooked during their move from salt water to fresh water. They eat zooplankton while they are in both saltwater and freshwater. Their gill rakers strain the zooplankton from the water. This is quite unlike most Pacific Salmon species, and this may be why they have such a striking color and a low concentration of methyl mercury due to this healthy intake. They also eat small aquatic organisms like shrimp and insects during the juvenile period. 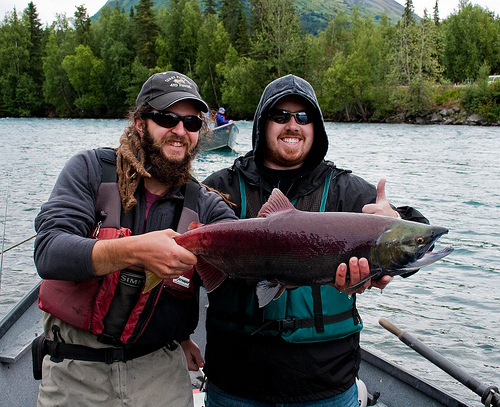 2 happy fishermen with their big sockeye salmon catch! Commercial Fishermen catch sockeye salmon using gillnets or seines. This fish is harvested particularly in Bristol Bay in Alaska, where it is sold as fresh or frozen fillets, or are canned. Fish canneries like canning this fish due to its rich orange-red flesh. However, more than half of sockeye salmons caught are sold as frozen fish. In terms of flavor, the smoked sockeye salmon has a firmer texture and a stronger flavor than the Coho Salmon. Recreational Fishermen also enjoy catching this fish using the fly fishing method. At present, it is listed under as an endangered species by the US Endangered Species Act and the National Marine Fisheries Service in the Snake River (Idaho, Oregon, Washington), and as a threatened species in Lake Ozette in Washington. 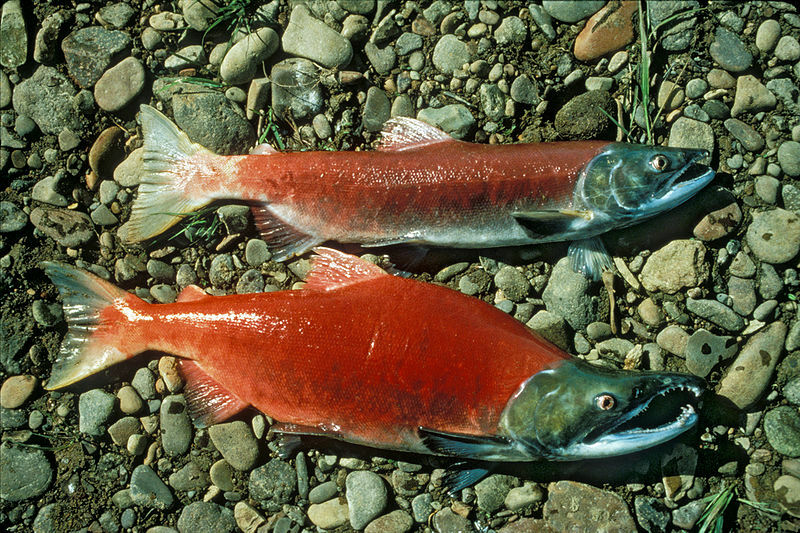 However, other sockeye populations such as the upper Columbia River and the Puget Sound in Washington are not listed as being a threatened species.